India is a lot more than the Taj Mahal and Qutub Minar. Looking beyond the historical mirror is the nature’s wonder in the country. From beaches, lakes, rivers to waterfalls, valleys and mountains – one can find everything right here on the Indian soil. To all the enthusiastic travelers reading this, you would have been to the famous Jog Falls in Karnataka and Dudhsagar Falls in Goa. But, how many of you actually know about the highest waterfalls in India? 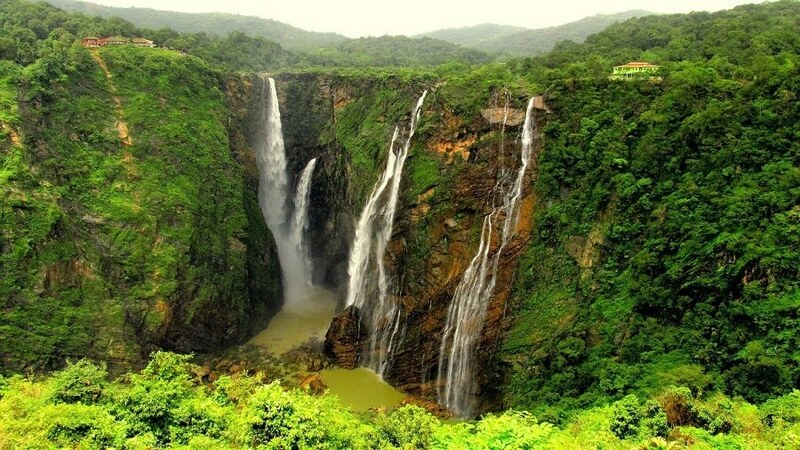 India is replete with waterfalls and some of the highest waterfalls are a treat to visit during monsoons. Read on to know about the top 5 highest waterfalls and the best way to reach the place. This year, make the most of monsoon in India. Located close to Mastikatte-Hulikat in the district of Shimoga, Karnataka is the highest waterfall of India – Kunchikal Falls. Formed by Varahi River, Kunchikal falls originates from a height of 455 meters. The river flows down cascading through the rocks turning it into a spectacular sight. A hydroelectric plant has been created near Masthikatte which has eventually reduced the flow of water to the fall. The best time to visit the place is during monsoons. During the months from July to September, the waterfall is at its best. How to reach: Book flight tickets to Bengaluru and continue your journey to Kunchikal by renting a car or board a bus from the city. You can also reach Mangalore by flight and then take a bus or car to Kunchikal. If you want to travel by train, board one from Mangalore to Shimoga station. Situated in the main area of Similipal National Park, Mayurbhanj District in Odisha, Barehipani Falls is famous as the second highest waterfall in the country falling from a height of 1,309ft. The waterfall is formed by the Budhabalanga River which flows over the Meghasan Mountain. It is one of the rare two tiered waterfall having two drops. One of the drops is of a height of 259 meters. How to reach: The nearest railway station from Barehipani Falls is Baripada. You can fly to the state capital, Bhubaneswar and take a train or book a car to Similipal National Park. Situated near Sangirang village, at a distance of 24 kilometers from Nongstoin, West Khasi Hills in the state of Meghalaya, Langshiang Falls is a famous waterfall in the North India falling from a height of 1,106ft (337 meters). You can also witness the majestic falls from the Mawpon village. According to the height, it holds the place of being the third highest waterfall in India. When visiting the falls, also plan a trip to the biggest river island in the state of Meghalaya, Nongkhnum Island, situated only 10 kilometers away from the sight of waterfall. How to reach: You can take a flight to Guwahati (150kms) or Shillong (105kms) and book a rental car to Langshiang falls (West Khasi Hills). To travel by train, you can book tickets from any part of the country to Shillong. The following journey would be best by car to West Khasi Hills. Situated near Cherrapunji in Meghalaya, Nohkalikai Falls is one of the highest waterfalls in India at a height of 335 meters (1,009ft). The falls is formed by the rainwater stored in the summit which has a comparatively reduced water flow during dry season from the months of December to February. The waterfall falls into a plunge pool of green water. There’s a story behind the name of the falls – Nohkalikai menas “Jump of Ka Likai” in Khasi language. A woman named Ka Likai of the village went insane after a family tragedy and jumped off the nearby cliff. How to reach: You can book a flight to the nearest airport, Guwahati Airport and cover the distance of 181 kilometers to Cherrapungi. Guwahati is the nearest railway station, well-connected with different parts of the country. You can rent a car from Guwahati to Cherrapunji, from where the waterfall is just 5 kilometers. Also famous as Seven Sisters Waterfalls and Mawsmai Falls, the Nohsngithiang Falls is situated in the East Khasi Hills of Meghalaya. You might not be aware of the fact that it’s a seven-segmented waterfall plunging from the top of the limestone cliffs of Khasi Hills. Like every other falls on the list, the best time to visit Seven Sisters falls is during monsoons. The waterfalls form a width of 70 meters and falls from a height of 1,033ft. It is a magical view, especially during dawn and dusk. How to reach: Cherappunji is the closest town to Mawsmai village. So, book tickets for a flight or train to the nearest airport or railway station, both of which is in Guwahati. How Many of These 10 Must-Have Travel Experiences in the US Have You Ticked Off Yet? 8 Allegiant Tips for Booking Cheap Last Minute Airfare That Actually Work!